Switchable Film, Privacy Film, Intelligent Film – whatever you want to call it, Smart Film Glass is one of the latest technological breakthroughs used to transform any office space in a snap. We understand that some days you enjoy your office environment to be bright and open, and on others you’re after just a little more privacy. That’s where Smart Film Glass comes in handy, as with just one click your window or partition can instantly transform from clear to opaque. It might seem like a bit of an odd concept right now, but the effect it has when changed is simply amazing. So, what actually is Smart Film Glass? Well, the LCD film is directly applied to glass using fuss-free self-adhesive to minimise mess and ensure a flawless finish. By passing an electrical current through the LCD interlayer, the visibility of the glass completely changes state. The system is operated by either a remote control, or a standard lighting switch. Though, sometimes the film can change state automatically – something we will explain a little later on. 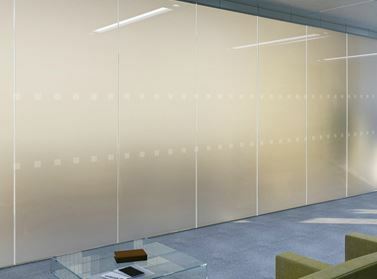 A huge benefit of Smart Film, is that it can be applied to existing windows or office partitions, so there’s no need to completely reinstall special glass into your office. Of course, the glass would need to be positioned adjacently to a power supply, to allow an electric current to pass through. Somewhere to place the transformer near to the feature is also necessary, and you have the option to keep this hidden away for a more sleek, elegant finish. Smart Film Glass serves as a great alternative to window blinds so you can have complete privacy as and when needed, but still retain the contemporary, modern office look. This is especially perfect for business meetings in boardrooms and conference rooms, to keep things under wraps in an instant. 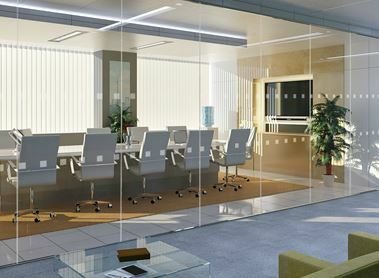 However, Smart Film Glass isn’t just useful when it comes to providing privacy, as many people overlook the way it can actually be used as a handy tool to aid business meetings. An important element of the product is it’s ability to serve as a projection screen, seamlessly displaying presentations and images; eliminating the need for a separate surface. Not only is this useful for in-office purposes, but is also a great way to advertise on store windows, with front and rear projection which displays on both sides. Not just a visibility changing product, Smart Film Glass is packed with many more features, depending on your requirements. If you’re looking to keep costs down, smart energy technology incorporates features which allow it to increase insulation in a room. Typically applied to outside windows, the product blocks infrared rays to keep the space cool in the summer, while ensuring there is minimal loss of heat in the winter. Similarly, heat technology can be used to increase the temperature in a room when turned on, and also keep window frost at bay in the winter time. Smart Film Glass can also be used to control light in the room, by changing state according to the amount of light penetrating an area. So, a strong amount of light would see the film in a translucent state, which would automatically change to transparent with weakened light. If you’re in two minds about having Smart Film Glass installed into your office, then it’s really a no-brainer. Whether you’re looking for a bit of privacy and simply don’t like the look of window blinds, or are looking for a low-cost way to maintain the temperature of a room, Smart Film Glass can provide you with these benefits without compromising your modern office look. After all, they don’t call it ‘smart’ glass for nothing.